How to get there: The best airport is Malaga. From the airport, drive 104 km east along the coast on Hwy. E15/N340. Turn north towards Granada on Hwy. E902/N323 and drive 26 km, then take a right exit on A348 (the sign says Beznar), and drive to Lanjaron, after Lanjaror continue towards Orgiva. After about 15 km on A348 and shortly before Orgiva turn left, the sign says Capileira. Drive about 12 km on this road and turn left (this time the sign may say Bubion). The remaining distance is now about 4 km, after passing Bubion, Capileira is only 2 more km up the valley. (Note: There exists an alternative (slightly shorter) route where you exit from the Granada (E902/N323) road earlier, however, we were not able to spot this exit.) 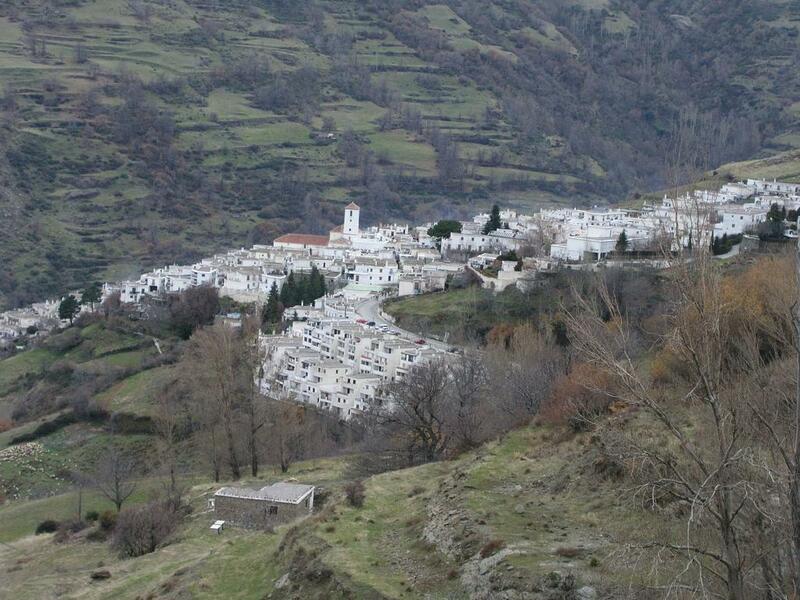 At elevation 1500 meter, Capileira is said to be the highest village in Spain. There is accomodation in Capileira, we stayed at Hotel Finca Los Llanos (phone +34-958763071, WEB: www.fincalosllanos.org), this hotel can be highly recommended (but stroll a few meters down the road for a better restaurant on you right). The hotel is located on the left hand side (drive up a steep, short hill), at the upper end of Capileira. Route description: Starting from Capileira, there are two different routes. One can hike via the mountain hut Refugio del Poqueira. This hut with 87 beds is open all year and offers a full service of meals to the hikers. Call and check before going (phone: +34-958343349). 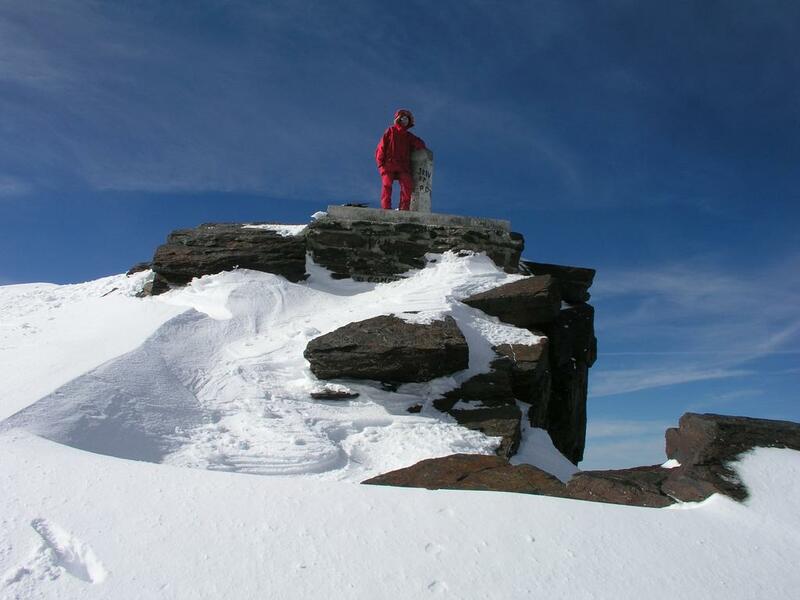 This hut is located below the SW slopes of the summit at elevation 2500 meter. The best way to hike from Capileira is as follows: Drive the road that continues uphill from Capileira for 3 km, just as this road shows its first bumps and curves right a smaller road forks left. The place is clearly identified by a sign pointing downhill saying Capileira 3km, Bubion 5km. Drive this road to its very end, another 4.3 km. The road is rough, but normal cars can use it, drive carefully. Towards the end, this road crosses the river in the bottom of the Poqueira Gorge twice, before ending right next to an old power station. There is a small U shaped walkway from the parking area to the place where the pipeline comes down the hill. The trail to the refugio heads right just after you cross the bridge, before this walkway heads back on the other side of the creek. Do not take the steep trail that climbs the cliff right next to the small parking area, it serves the power station. From the refugio, there are several alternative routes to the summit, consult your map and the information available in the refugio. 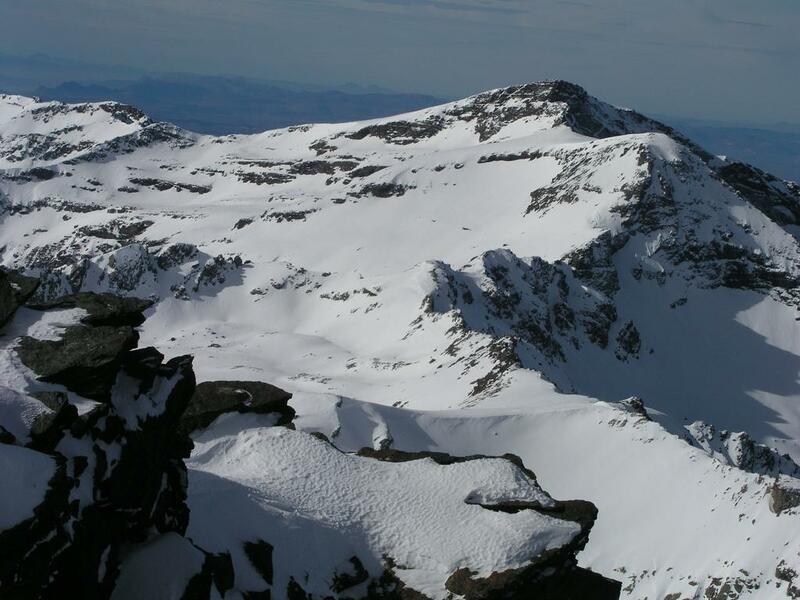 In particular, one can hike up the south ridge near the saddle before the final Mulhacén ridge, then complete the climb as descriped below. The second route follows the road from Capileira to the south ridge of Mulhacén. A high road crossing the mountain range to the north was constructed, but has since been closed to traffic. In summer, this option may be less attractive, but do offer a start at elevation 2160m. In winter, if the snow completely covers the road, this is the best and recommended approach on skis. The short trip report below contains additional facts and observations concerning this route. Due to what seemed like a very low snow line, we decided to start as high as possible (1820 meter), climb the ridge and, hopefully, have less snow and more favorable hiking conditions than running the risk of a struggle in deep snow from the bottom of the Poqueira canyon and to the ridge. Also, due to a late arrival in Capileira, an initial hike to the refugio was not an option for us, this may be a good choice for parties that arrive a bit earlier in the day. We parked at the 1820 meter entrance to the national park. This is a bit less than 5 km from Capileira, just where the road changes from being paved to dirt. A small road forks off to the left and there is parking for several cars in this area. Starting out at 0620 in darkness but for a few stars in the sky, we decided to hike up along the road. Note, however, that a better route is to stay just left of (but follow), the very distinct line that separates the trees (right) from an open area (left). This line climbs all the way to the vicinity of the last, sharp right curve (when going uphill) of the road. The road was soon buried in snow and we arrived at the parking area just before the road closure after one hour. This location has coordinates N36:58.108, W003:19.983, and, at 2160 meter, is as high as one can drive in summer. We continued a bit along the road, then cut left and crossed through a forest (in deep snow) before entering an open slope. Luckily, the snow crust supported us and we ascended the slope crossing the road and gaining the road once more where it contours north a bit below the high ridge of Loma de Piedra Blanca. We generally followed the same contour as the buried road, curving a bit left in order to gain the low saddle between Loma de Piedra Blanca and the continued south ridge of Mulhacén. From here the route is pretty obvious as it crosses a small hump to another saddle, then climbs more distinctly. Towards the end, the slope becomes more gentle, a few false summits, but finally the summit comes into view. We arrived at 1305, 6 hours and 45 minutes of pretty hard uphill walking in snow that only partially supported our weight. How much easier this had been on skis! Unfortunately, we had been advised that this was not a route to ski. Quite the opposite, better conditions for skiing are hard to find, one could essentially ski directly from where the car was parked. The ridge ends abruptly at the summit, there is a considerable and impressive drop into the valley just north of the mountain. The entire route is clearly (YDS) class 1 in summer, it is a nice and easy cross country ski route during winter when the snow cover is as good as we experienced it. The summit offered us sunshine and quite moderate wind, it seemed well deserved to have some bread and a good rest while looking around. 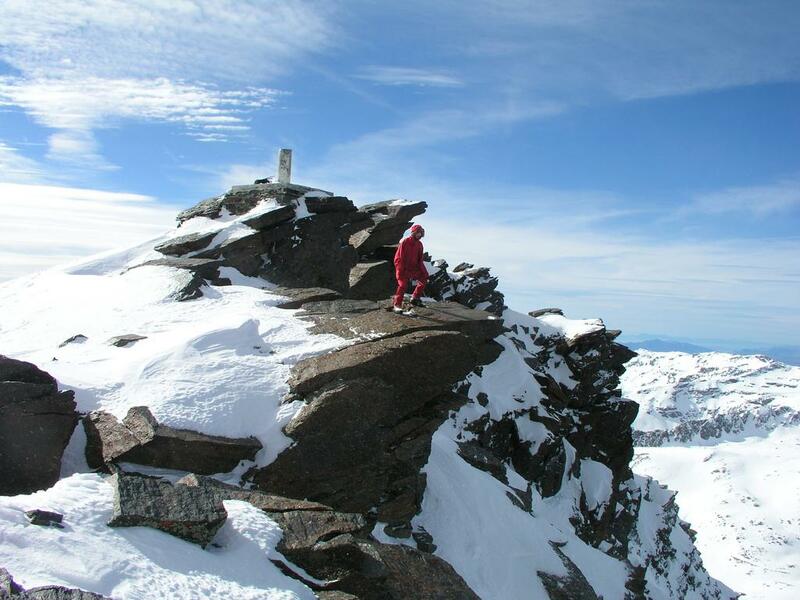 The Mediterranean to the south, only 33 km away, the impressive Veleta, 3394 meter to the west, the second highest peak. From our position, it looked almost as high as our Mulhacén. We left the summit after 25 minutes, with another lasting memory of a nice peak, brilliant white snow and all this just for ourselves. In fact, we did not see a single person until we were back down at 1710 in the area where we had parked the car. We returned from the Loma de Piedra Blanca ridge along the very distinct edge of the forest, this is clearly a much better route than following the road. A nice snow slope all the way down to 1900 meter. After 10 hours and 50 minutes in the snow, we certainly looked forward to a warm shower and a nice evening meal back in Capileira. Comments: Note that the correct Spanish pronounciation is Mula"th"en. I did this climb with my son Pål Jørgen, age 14. If we had carried skis from Norway, the ascent would have been at least 2 hours quicker, the return could easily have been accomplished in less than one hour. 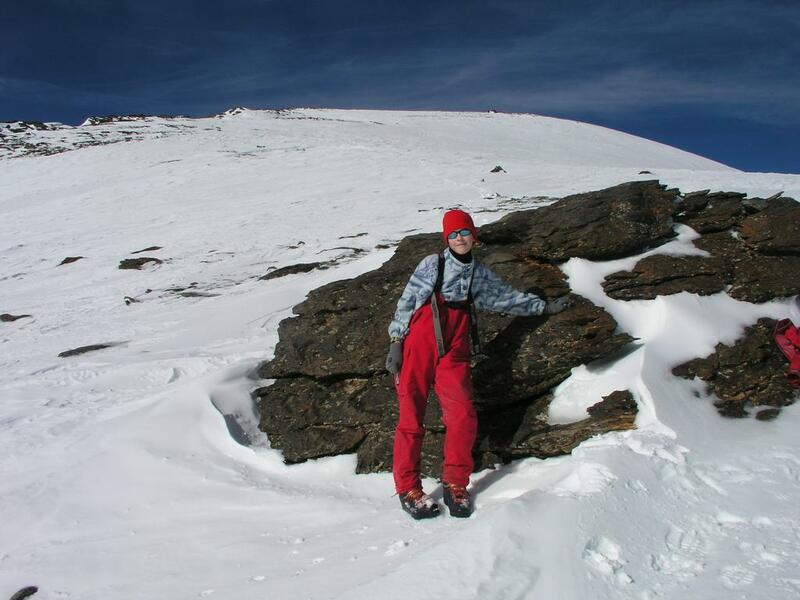 I had however, been told (by a reliable source that organizes winter activities in Sierra Nevada) that this route was normally done without skis all winter and that the south ridge was often clear of snow from prevailing winds. Obviously, the mountains had much more snow than normal, the snow line was well below 2000 meter. 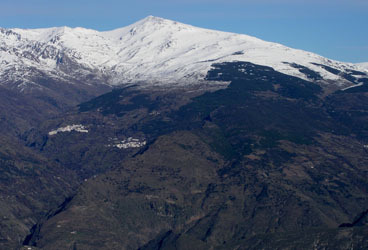 It is therefore strongly recommended to call ahead and ask if one can see snow on the hills across from Capileira. If this is the case, then bring your skis. How to use a Saturday before Chrismas: Pål Jørgen skipped the last day of school and took an early Friday morning flight from Bergen via Copenhagen to Madrid. I was done serving on an external review for the Austrian Science Council on Friday morning and travelled from Linz via Frankfurt to Madrid. We arrived within 10 minutes and travelled together to Malaga. Avis provided a car and soon we were having a nice dinner in the highest village of Spain - Capileira. Saturday in the mountains then our return flight to Norway and Christmas on Sunday. Sierra Nevada with Mulhacén, as seen from the air, December 6. 2005. Sierra Nevada as seen from the top of Sierra de Lújar. The charming village of Capileira. On the summit, Pål Jørgen enjoys the view. The terrain across to Veleta, 3394 m.There is a ski resort just behind this peak. Panorama view west, Veleta, 3394m is highest, steeper terrain to the north. The upper part of the north face. Part way down the ridge, this picture shows the gentle slope we descended before having a rest here. The lower part of the south ridge. This picture is taken from the same location as the one above. 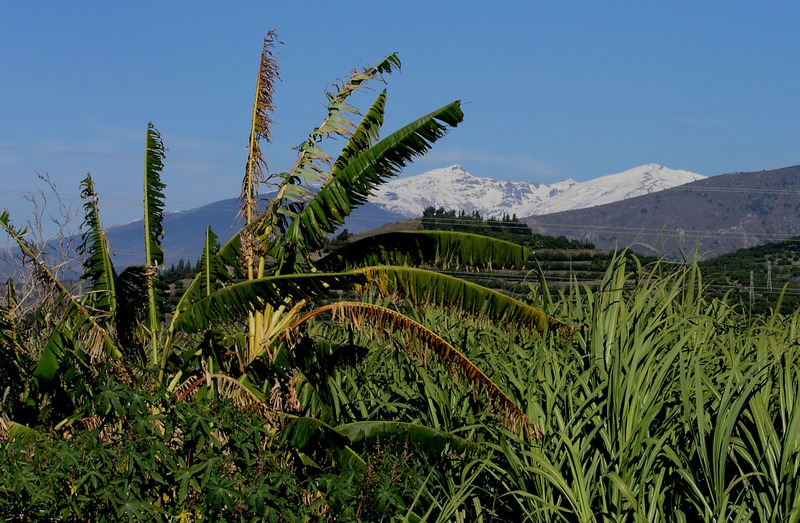 The lower part of the ridge called Loma de Piedra Blanca, is almost level with several small local tops around 2500 meter. Notice Sierra de Lújar in the distance. 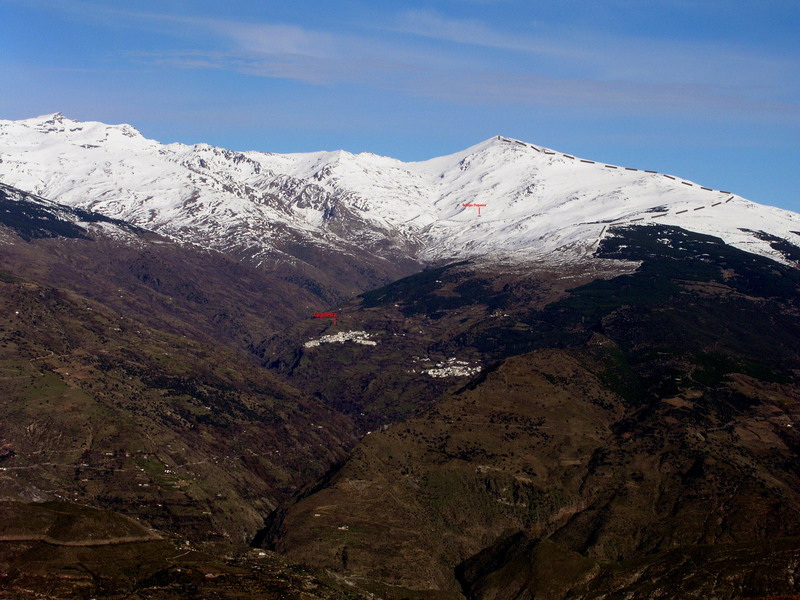 Mulhacén south ridge.This picture, taken from Sierra de Lújar, shows the village of Capileira, the Refugio Poqueira, the recommended route for a ski ascent follows the left side of the forest as indicated. One can drive from Capileira to (or close to) the snow line. The Sierra Nevada as seen from the Mediterranean coast. Palm trees with snowy mountains just 30 km away.